This article is about the asteroid. For the Roman goddess, see Vesta (mythology). For other uses, see Vesta (disambiguation). Vesta (minor-planet designation: 4 Vesta) is one of the largest objects in the asteroid belt, with a mean diameter of 525 kilometres (326 mi). It was discovered by the German astronomer Heinrich Wilhelm Olbers on 29 March 1807 and is named after Vesta, the virgin goddess of home and hearth from Roman mythology. Vesta is the second-most-massive and second-largest body in the asteroid belt, after the dwarf planet Ceres, and it contributes an estimated 9% of the mass of the asteroid belt. It is slightly larger than Pallas, though significantly more massive. Vesta is the only known remaining rocky protoplanet (with a differentiated interior) of the kind that formed the terrestrial planets. Numerous fragments of Vesta were ejected by collisions one and two billion years ago that left two enormous craters occupying much of Vesta's southern hemisphere. Debris from these events has fallen to Earth as howardite–eucrite–diogenite (HED) meteorites, which have been a rich source of information about Vesta. Vesta is the brightest asteroid visible from Earth. Its maximum distance from the Sun is slightly greater than the minimum distance of Ceres from the Sun,[c] though its orbit lies entirely within that of Ceres. NASA's Dawn spacecraft entered orbit around Vesta on 16 July 2011 for a one-year exploration and left orbit on 5 September 2012 en route to its final destination, Ceres. Researchers continue to examine data collected by Dawn for additional insights into the formation and history of Vesta. Size comparison: the first 10 asteroid-belt objects profiled against the Moon. Vesta is fourth from the left. Heinrich Olbers discovered Pallas in 1802, the year after the discovery of Ceres. He proposed that the two objects were the remnants of a destroyed planet. He sent a letter with his proposal to the English astronomer William Herschel, suggesting that a search near the locations where the orbits of Ceres and Pallas intersected might reveal more fragments. These orbital intersections were located in the constellations of Cetus and Virgo. Olbers commenced his search in 1802, and on 29 March 1807 he discovered Vesta in the constellation Virgo—a coincidence, because Ceres, Pallas, and Vesta are not fragments of a larger body. Because the asteroid Juno had been discovered in 1804, this made Vesta the fourth object to be identified in the region that is now known as the asteroid belt. The discovery was announced in a letter addressed to German astronomer Johann H. Schröter dated 31 March. Because Olbers already had credit for discovering a planet (Pallas; at the time, the asteroids were considered to be planets), he gave the honor of naming his new discovery to German mathematician Carl Friedrich Gauss, whose orbital calculations had enabled astronomers to confirm the existence of Ceres, the first asteroid, and who had computed the orbit of the new planet in the remarkably short time of 10 hours. Gauss decided on the Roman virgin goddess of home and hearth, Vesta. After the discovery of Vesta, no further objects were discovered for 38 years, and the Solar System was thought to have eleven planets. However, in 1845, new asteroids started being discovered at a rapid pace, and by 1851 there were fifteen, each with its own symbol, in addition to the eight major planets (Neptune had been discovered in 1846). It soon became clear that it would be impractical to continue inventing new planetary symbols indefinitely, and some of the existing ones proved difficult to draw quickly. That year, the problem was addressed by Benjamin Apthorp Gould, who suggested numbering asteroids in their order of discovery, and placing this number in a disk (circle) as the generic symbol of an asteroid. Thus, the fourth asteroid, Vesta, acquired the generic symbol ④. This was soon coupled with the name into an official number–name designation, ④ Vesta, as the number of minor planets increased. By 1858, the circle had been simplified to parentheses, (4) Vesta, which were easier to typeset. Other punctuation, such as 4) Vesta and 4, Vesta, was also used, but had more or less completely died out by 1949. Today, either Vesta, or, more commonly, 4 Vesta, is used. SPHERE image is shown on the left, with a synthetic view derived from space-based data shown on the right for comparison. Photometric observations of Vesta were made at the Harvard College Observatory in 1880–1882 and at the Observatoire de Toulouse in 1909. These and other observations allowed the rotation rate of Vesta to be determined by the 1950s. However, the early estimates of the rotation rate came into question because the light curve included variations in both shape and albedo. Early estimates of the diameter of Vesta ranged from 383 (in 1825) to 7005444000000000000♠444 km. E.C. Pickering produced an estimated diameter of 7005513000000000000♠513±17 km in 1879, which is close to the modern value for the mean diameter, but the subsequent estimates ranged from a low of 7005390000000000000♠390 km up to a high of 7005602000000000000♠602 km during the next century. The measured estimates were based on photometry. In 1989, speckle interferometry was used to measure a dimension that varied between 498 and 7005548000000000000♠548 km during the rotational period. In 1991, an occultation of the star SAO 93228 by Vesta was observed from multiple locations in the eastern United States and Canada. Based on observations from 14 different sites, the best fit to the data was an elliptical profile with dimensions of about 7005550000000000000♠550 km × 7005462000000000000♠462 km. Dawn confirmed this measurement. Vesta became the first asteroid to have its mass determined. 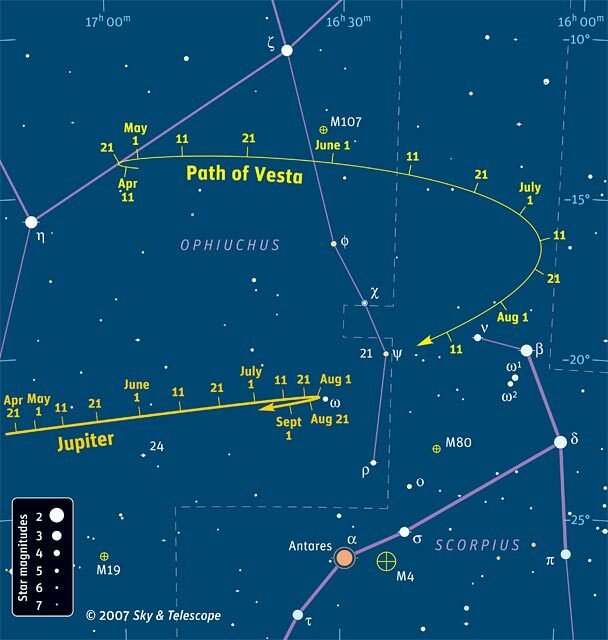 Every 18 years, the asteroid 197 Arete approaches within 7009598391482800000♠0.04 AU of Vesta. In 1966, based upon observations of Vesta's gravitational perturbations of Arete, Hans G. Hertz estimated the mass of Vesta as 6990120000000000000♠(1.20±0.08)×10−10 solar masses. More refined estimates followed, and in 2001 the perturbations of 17 Thetis were used to estimate the mass of Vesta as 6990131000000000000♠(1.31±0.02)×10−10 solar masses. Vesta orbits the Sun between Mars and Jupiter, within the asteroid belt, with a period of 3.6 Earth years, specifically in the inner asteroid belt, interior to the Kirkwood gap at 2.50 AU. Its orbit is moderately inclined (i = 7.1°, compared to 7° for Mercury and 17° for Pluto) and moderately eccentric (e = 0.09, about the same as for Mars). True orbital resonances between asteroids are considered unlikely; due to their small masses relative to their large separations, such relationships should be very rare. 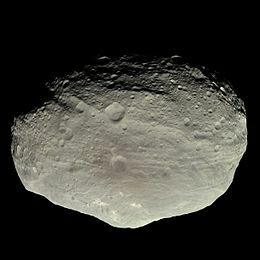 Nevertheless, Vesta is able to capture other asteroids into temporary 1:1 resonant orbital relationships (for periods up to 2 million years or more); about forty such objects have been identified. Decameter-sized objects detected in the vicinity of Vesta by Dawn may be such quasi-satellites rather than proper satellites. Olbers Regio (dark area) defines the prime meridian in the IAU coordinate system. It is shown here in a Hubble shot of Vesta, because it is not visible in the more detailed Dawn images. Claudia crater (indicated by the arrow at the bottom of the closeup image at right) defines the prime meridian in the Dawn/NASA coordinate system. Vesta's rotation is relatively fast for an asteroid (5.342 h) and prograde, with the north pole pointing in the direction of right ascension 20 h 32 min, declination +48° (in the constellation Cygnus) with an uncertainty of about 10°. This gives an axial tilt of 29°. There are two longitudinal coordinate systems in use for Vesta, with prime meridians separated by 150°. The IAU established a coordinate system in 1997 based on Hubble photos, with the prime meridian running through the center of Olbers Regio, a dark feature 200 km across. When Dawn arrived at Vesta, mission scientists found that the location of the pole assumed by the IAU was off by 10°, so that the IAU coordinate system drifted across the surface of Vesta at 0.06° per year, and also that Olbers Regio was not discernible from up close, and so was not adequate to define the prime meridian with the precision they needed. They corrected the pole, but also established a new prime meridian 4° from the center of Claudia, a sharply defined crater 700 meters across, which they say results in a more logical set of mapping quadrangles. 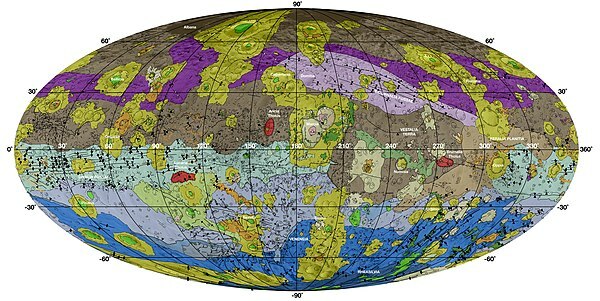 All NASA publications, including images and maps of Vesta, use the Claudian meridian, which is unacceptable to the IAU. The IAU Working Group on Cartographic Coordinates and Rotational Elements recommended a coordinate system, correcting the pole but rotating the Claudian longitude by 150° to coincide with Olbers Regio. It was accepted by the IAU, though it disrupts the maps prepared by the Dawn team, which had been positioned so they would not bisect any major surface features. The IAU 2006 draft proposal on the definition of a planet listed Vesta as a candidate. 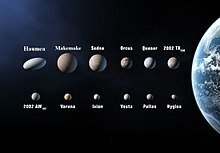 Vesta is shown fourth from the left along the bottom row. Vesta is the second-most-massive body in the asteroid belt, though only 28% as massive as Ceres. Vesta's density is lower than those of the four terrestrial planets, but higher than that of most asteroids and all of the moons in the Solar System except Io. Vesta's surface area is about the same as that of Pakistan (about 800,000 square kilometers). [f] It has a differentiated interior. Vesta is only slightly larger (7005525400000000000♠525.4±0.2 km) than 2 Pallas (7005512000000000000♠512±3 km) in volume, but is about 25% more massive. Vesta's shape is close to a gravitationally relaxed oblate spheroid, but the large concavity and protrusion at the southern pole (see 'Surface features' below) combined with a mass less than 7020500000000000000♠5×1020 kg precluded Vesta from automatically being considered a dwarf planet under International Astronomical Union (IAU) Resolution XXVI 5. A 2012 analysis of Vesta's shape and gravity field using data gathered by the Dawn spacecraft has shown that Vesta is currently not in hydrostatic equilibrium. Temperatures on the surface have been estimated to lie between about −20 °C with the Sun overhead, dropping to about −190 °C at the winter pole. Typical daytime and nighttime temperatures are −60 °C and −130 °C respectively. This estimate is for 6 May 1996, very close to perihelion, although details vary somewhat with the seasons. The most ancient and heavily cratered regions are brown; areas modified by the Veneneia and Rheasilvia impacts are purple (the Saturnalia Fossae Formation, in the north) and light cyan (the Divalia Fossae Formation, equatorial), respectively; the Rheasilvia impact basin interior (in the south) is dark blue, and neighboring areas of Rheasilvia ejecta (including an area within Veneneia) are light purple-blue; areas modified by more recent impacts or mass wasting are yellow/orange or green, respectively. Northern (left) and southern (right) hemispheres. The 'Snowman' craters are at the top of the left image; Rheasilvia and Veneneia (green and blue) dominate the right. Parallel troughs are seen in both. Colors of the two hemispheres are not to scale,[g] and the equatorial region is not shown. South pole of Vesta, showing the extent of Rheasilvia crater. Prior to the arrival of the Dawn spacecraft, some Vestan surface features had already been resolved using the Hubble Space Telescope and ground-based telescopes (e.g. the Keck Observatory). The arrival of Dawn in July 2011 revealed the complex surface of Vesta in detail. The most prominent of these surface features are two enormous craters, the 500-kilometre (311 mi)-wide Rheasilvia crater, centered near the south pole, and the 400 kilometres (249 mi) wide Veneneia crater. The Rheasilvia crater is younger and overlies the Veneneia crater. The Dawn science team named the younger, more prominent crater Rheasilvia, after the mother of Romulus and Remus and a mythical vestal virgin. Its width is 95% of the mean diameter of Vesta. The crater is about 19 kilometres (12 mi) deep. A central peak rises 23 km above the lowest measured part of the crater floor and the highest measured part of the crater rim is 31 km above the crater floor low point. It is estimated that the impact responsible excavated about 1% of the volume of Vesta, and it is likely that the Vesta family and V-type asteroids are the products of this collision. If this is the case, then the fact that 10-km fragments have survived bombardment until the present indicates that the crater is at most only about 1 billion years old. It would also be the site of origin of the HED meteorites. All the known V-type asteroids taken together account for only about 6% of the ejected volume, with the rest presumably either in small fragments, ejected by approaching the 3:1 Kirkwood gap, or perturbed away by the Yarkovsky effect or radiation pressure. Spectroscopic analyses of the Hubble images have shown that this crater has penetrated deep through several distinct layers of the crust, and possibly into the mantle, as indicated by spectral signatures of olivine. The large peak at the center of Rheasilvia is 20 to 25 kilometres (12–16 mi) high and 180 kilometres (110 mi) wide, and is possibly a result of a planetary-scale impact. Feralia Planitia, an old, degraded crater near Vesta's equator (green and blue). It is 270 km across and predates Rheasilvia (green at bottom). 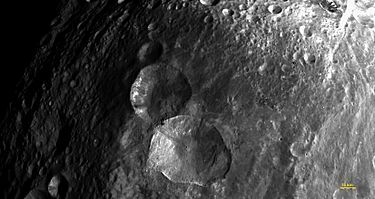 Several old, degraded craters rival Rheasilvia and Veneneia in size, though none are quite so large. They include Feralia Planitia, shown at right, which is 270 km across. More-recent, sharper craters range up to 158 kilometres (98 mi) Varronilla and 196 kilometres (122 mi) Postumia. The "snowman craters" is an informal name given to a group of three adjacent craters in Vesta's northern hemisphere. Their official names from largest to smallest (west to east) are Marcia, Calpurnia, and Minucia. Marcia is the youngest and cross-cuts Calpurnia. Minucia is the oldest. The majority of the equatorial region of Vesta is sculpted by a series of concentric troughs. The largest is named Divalia Fossa (10–20 km wide, 465 km long). Despite the fact that Vesta is a one-seventh the size of the Moon, Divalia Fossa dwarfs the Grand Canyon. A second series, inclined to the equator, is found further north. The largest of the northern troughs is named Saturnalia Fossa (≈ 40 km wide, > 370 km long). These troughs are thought to be large-scale graben resulting from the impacts that created Rheasilvia and Veneneia craters, respectively. They are some of the longest chasms in the Solar System, nearly as long as Ithaca Chasma on Tethys. The troughs may be graben that formed after another asteroid collided with Vesta, a process that can happen only in a body that, like Vesta, is differentiated. Vesta's differentiation is one of the reasons why scientists consider it a protoplanet. Compositional information from the visible and infrared spectrometer (VIR), gamma-ray and neutron detector (GRaND), and framing camera (FC), all indicate that the majority of the surface composition of Vesta is consistent with the composition of the howardite, eucrite, and diogenite meteorites. The Rheasilvia region is richest in diogenite, consistent with the Rheasilvia-forming impact excavating material from deeper within Vesta. The presence of olivine within the Rheasilvia region would also be consistent with excavation of mantle material. However, olivine has only been detected in localized regions of the northern hemisphere, not within Rheasilvia. The origin of this olivine is currently uncertain. Pitted terrain has been observed in four craters on Vesta: Marcia, Cornelia, Numisia and Licinia. The formation of the pitted terrain is proposed to be degassing of impact-heated volatile-bearing material. Along with the pitted terrain, curvilinear gullies are found in Marcia and Cornelia craters. The curvilinear gullies end in lobate deposits, which are sometimes covered by pitted terrain, and are proposed to form by the transient flow of liquid water after buried deposits of ice were melted by the heat of the impacts. Hydrated materials have also been detected, many of which are associated with areas of dark material. Consequently, dark material is thought to be largely composed of carbonaceous chondrite, which was deposited on the surface by impacts. Carbonaceous chondrites are comparatively rich in mineralogically bound OH. Extrusion of the remaining molten material to form the crust, either as basaltic lavas in progressive eruptions, or possibly forming a short-lived magma ocean. The deeper layers of the crust crystallize to form plutonic rocks, whereas older basalts are metamorphosed due to the pressure of newer surface layers. Vesta is the only known intact asteroid that has been resurfaced in this manner. Because of this, some scientists refer to Vesta as a protoplanet. However, the presence of iron meteorites and achondritic meteorite classes without identified parent bodies indicates that there once were other differentiated planetesimals with igneous histories, which have since been shattered by impacts. A lithified regolith, the source of howardites and brecciated eucrites. Basaltic lava flows, a source of non-cumulate eucrites. Plutonic rocks consisting of pyroxene, pigeonite and plagioclase, the source of cumulate eucrites. Plutonic rocks rich in orthopyroxene with large grain sizes, the source of diogenites. On the basis of the sizes of V-type asteroids (thought to be pieces of Vesta's crust ejected during large impacts), and the depth of Rheasilvia crater (see below), the crust is thought to be roughly 10 kilometres (6 mi) thick. Findings from the Dawn spacecraft have found evidence that the troughs that wrap around Vesta could be graben formed by impact-induced faulting (see Troughs section above), meaning that Vesta has more complex geology than other asteroids. 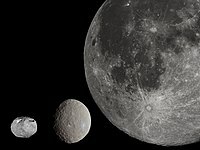 Vesta could have been classified as a dwarf planet if it had retained a spherical shape, and it has other qualities that lead to the thought it could be a protoplanet. The only thing that knocked it out of the category of a dwarf planet was the formation of two large impact basins at its southern pole. At the time of these impacts Vesta was not warm and plastic enough to return to a shape in hydrostatic equilibrium. Vesta's surface is covered by regolith distinct from that found on the Moon or asteroids such as Itokawa. This is because space weathering acts differently. Vesta's surface shows no significant trace of nanophase iron because the impact speeds on Vesta are too low to make rock melting and vaporization an appreciable process. Instead, regolith evolution is dominated by brecciation and subsequent mixing of bright and dark components. The dark component is probably due to the infall of carbonaceous material, whereas the bright component is the original Vesta basaltic soil. Some small Solar System bodies are suspected to be fragments of Vesta caused by impacts. The Vestian asteroids and HED meteorites are examples. The V-type asteroid 1929 Kollaa has been determined to have a composition akin to cumulate eucrite meteorites, indicating its origin deep within Vesta's crust. In 1981, a proposal for an asteroid mission was submitted to the European Space Agency (ESA). Named the Asteroidal Gravity Optical and Radar Analysis (AGORA), this spacecraft was to launch some time in 1990–1994 and perform two flybys of large asteroids. The preferred target for this mission was Vesta. AGORA would reach the asteroid belt either by a gravitational slingshot trajectory past Mars or by means of a small ion engine. However, the proposal was refused by the ESA. A joint NASA–ESA asteroid mission was then drawn up for a Multiple Asteroid Orbiter with Solar Electric Propulsion (MAOSEP), with one of the mission profiles including an orbit of Vesta. NASA indicated they were not interested in an asteroid mission. Instead, the ESA set up a technological study of a spacecraft with an ion drive. Other missions to the asteroid belt were proposed in the 1980s by France, Germany, Italy and the United States, but none were approved. Exploration of Vesta by fly-by and impacting penetrator was the second main target of the first plan of the multi-aimed Soviet Vesta mission, developed in cooperation with European countries for realisation in 1991–1994 but canceled due to the Soviet Union disbanding. First image of asteroids (Ceres and Vesta) taken from Mars. The image was made by the Curiosity rover on 20 April 2014. In the early 1990s, NASA initiated the Discovery Program, which was intended to be a series of low-cost scientific missions. In 1996, the program's study team recommended a mission to explore the asteroid belt using a spacecraft with an ion engine as a high priority. Funding for this program remained problematic for several years, but by 2004 the Dawn vehicle had passed its critical design review and construction proceeded. It launched on 27 September 2007 as the first space mission to Vesta. 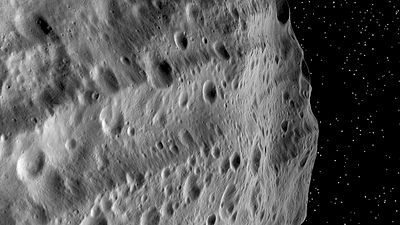 On 3 May 2011, Dawn acquired its first targeting image 1.2 million kilometers from Vesta. On 16 July 2011, NASA confirmed that it received telemetry from Dawn indicating that the spacecraft successfully entered Vesta's orbit. It was scheduled to orbit Vesta for one year, until July 2012. Dawn's arrival coincided with late summer in the southern hemisphere of Vesta, with the large crater at Vesta's south pole (Rheasilvia) in sunlight. Because a season on Vesta lasts eleven months, the northern hemisphere, including anticipated compression fractures opposite the crater, would become visible to Dawn's cameras before it left orbit. Dawn left orbit around Vesta on 4 September 2012 11:26 p.m. PDT to travel to Ceres. NASA/DLR released imagery and summary information from a survey orbit, two high-altitude orbits (60–70 m/pixel) and a low-altitude mapping orbit (20 m/pixel), including digital terrain models, videos and atlases. Scientists also used Dawn to calculate Vesta's precise mass and gravity field. The subsequent determination of the J2 component yielded a core diameter estimate of about 220 km assuming a crustal density similar to that of the HED. Dawn data can be accessed by the public at the UCLA website. Detailed images retrieved during the high-altitude (60–70 m/pixel) and low-altitude (~20 m/pixel) mapping orbits are available on the Dawn Mission website of JPL/NASA. Its size and unusually bright surface make Vesta the brightest asteroid, and it is occasionally visible to the naked eye from dark skies (without light pollution). In May and June 2007, Vesta reached a peak magnitude of +5.4, the brightest since 1989. At that time, opposition and perihelion were only a few weeks apart. It was brighter still at its 22 June 2018 opposition, reaching a magnitude of +5.3. Less favorable oppositions during late autumn 2008 in the Northern Hemisphere still had Vesta at a magnitude of from +6.5 to +7.3. Even when in conjunction with the Sun, Vesta will have a magnitude around +8.5; thus from a pollution-free sky it can be observed with binoculars even at elongations much smaller than near opposition. In 2010, Vesta reached opposition in the constellation of Leo on the night of 17–18 February, at about magnitude 6.1, a brightness that makes it visible in binocular range but generally not for the naked eye. Under perfect dark sky conditions where all light pollution is absent it might be visible to an experienced observer without the use of a telescope or binoculars. Vesta came to opposition again on 5 August 2011, in the constellation of Capricornus at about magnitude 5.6. Vesta was at opposition again on 9 December 2012. According to Sky and Telescope magazine, this year Vesta came within about 6 degrees of 1 Ceres during the winter of 2012 and spring 2013. Vesta orbits the Sun in 3.63 years and Ceres in 4.6 years, so every 17 years Vesta overtakes Ceres (the last overtaking was in 1996). On December 1, 2012, Vesta had a magnitude of 6.6, but decreasing to 8.4 by May 1, 2013. Ceres and Vesta came within one degree of each other in the night sky in July 2014. ^ Marc Rayman of the JPL Dawn team used "Vestian" a few times in 2010 and early 2011 in his Dawn Journal. However, since that time, and outside the journal, the form "Vestan" has been used by JPL. Most modern print sources also use "Vestan", though the Planetary Society continues to use "Vestian". The form "Vestalian" correctly refers to people or things associated with Vesta, such as the vestal virgins, not to Vesta herself. ^ a b Calculated using the known dimensions assuming an ellipsoid. ^ 維斯塔 wéisītǎ, with an obscure ī, is the closest Chinese approximation of the Latin pronunciation westa. ^ Other sources contemporaneous to Gauss used a more elaborate form of the symbol, . ^ Or Venezuela or Tanzania; somewhat larger than Texas and ten times that of the UK. ^ Note that there is very strong evidence that 6 Hebe is the parent body for H-chondrites, one of the most common meteorite types. ^ "Search - Dawn Mission". JPL. Archived from the original on 5 March 2016. ^ "Search Results". Planetary Society. ^ a b c d e f g "JPL Small-Body Database Browser: 4 Vesta". Retrieved 1 June 2008. ^ "AstDyS-2 Vesta Synthetic Proper Orbital Elements". Department of Mathematics, University of Pisa, Italy. Retrieved 1 October 2011. ^ a b c d e f g Russell, C. T.; et al. (2012). 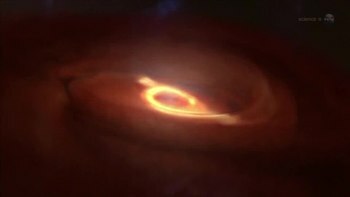 "Dawn at Vesta: Testing the Protoplanetary Paradigm". Science. 336 (6082): 684–686. Bibcode:2012Sci...336..684R. doi:10.1126/science.1219381. PMID 22582253. ^ "Wolfram-Alpha: Computational Knowledge Engine". ^ Harris, A. W. (2006). Warner, B. D.; Pravec, P., eds. "Asteroid Lightcurve Derived Data. EAR-A-5-DDR-DERIVED-LIGHTCURVE-V8.0". NASA Planetary Data System. Archived from the original on 17 January 2010. Retrieved 2013-12-26. ^ a b Tedesco, E. F.; Noah, P. V.; Noah, M.; Price, S. D. (2004). "Infra-Red Astronomy Satellite (IRAS) Minor Planet Survey. IRAS-A-FPA-3-RDR-IMPS-V6.0". NASA Planetary Data System. Archived from the original on 9 April 2009. Retrieved 15 March 2007. ^ a b Mueller, T. G.; Metcalfe, L. (2001). "ISO and Asteroids" (PDF). ESA Bulletin. 108: 38. ^ Neese, C.; Ed. (2005). "Asteroid Taxonomy EAR-A-5-DDR-TAXONOMY-V5.0". NASA Planetary Data System. Archived from the original on 10 March 2007. Retrieved 2013-12-25. ^ Menzel, Donald H. & Pasachoff, Jay M. (1983). A Field Guide to the Stars and Planets (2nd ed.). Boston, MA: Houghton Mifflin. p. 391. ISBN 978-0-395-34835-2. ^ "NASA – Dawn at a Glance". NASA. Retrieved 14 August 2011. ^ Lang, Kenneth (2011). The Cambridge Guide to the Solar System. Cambridge University Press. pp. 372, 442. ^ Russell et al. 2011. "Exploring the smallest terrestrial planet: Dawn at Vesta"
^ a b Pitjeva, E. V. (2005). "High-Precision Ephemerides of Planets—EPM and Determination of Some Astronomical Constants" (PDF). Solar System Research. 39 (3): 176–186. Bibcode:2005SoSyR..39..176P. doi:10.1007/s11208-005-0033-2. Archived from the original (PDF) on 31 October 2008. ^ a b Carry, B.; et al. (2009). "Physical properties of (2) Pallas". Icarus. 205 (2): 460–472. arXiv:0912.3626v1. doi:10.1016/j.icarus.2009.08.007. ^ a b Savage, Don; Jones, Tammy & Villard, Ray (1995). "Asteroid or Mini-Planet? Hubble Maps the Ancient Surface of Vesta". Hubble Site News Release STScI-1995-20. Retrieved 17 October 2006. ^ "A look into Vesta's interior". Max Planck Society. 6 January 2011. Retrieved 7 January 2011. ^ "Asteroid Vesta is 'last of a kind' rock". BBC, 11 May 2012. ^ Jutzi, M.; E. Asphaug; P. Gillet; J.-A. Barrat; W. Benz (14 February 2013). "The structure of the asteroid 4 Vesta as revealed by models of planet-scale". Nature. 494 (7436): 207–210. Bibcode:2013Natur.494..207J. doi:10.1038/nature11892. PMID 23407535. ^ Cook, Jia-Rui. "Dawn Reality-Checks Telescope Studies of Asteroids". Archived from the original on 2 May 2014. Retrieved 30 April 2014. ^ McSween, H. Y.; R. P. Binzel; M. C. De Sanctis; E. Ammannito; T. H. Prettyman; A. W. Beck; V. Reddy; L. Le Corre; M. J. Gaffey; et al. (27 November 2013). "Dawn; the Vesta-HED connection; and the geologic context for eucrite, diogenites, and howardites". Meteoritics & Planetary Science. 48 (11): 2090–21–4. Bibcode:2013M&PS...48.2090M. doi:10.1111/maps.12108. ^ a b Kelley, M. S.; et al. (2003). "Quantified mineralogical evidence for a common origin of 1929 Kollaa with 4 Vesta and the HED meteorites". Icarus. 165 (1): 215–218. Bibcode:2003Icar..165..215K. doi:10.1016/S0019-1035(03)00149-0. ^ a b "Vesta". NASA/JPL. 12 July 2011. Archived from the original on 29 June 2011. Retrieved 30 July 2011. ^ "Ceres, Pallas, Vesta, and Hygiea". Gravity Simulator. Archived from the original on 17 June 2008. Retrieved 31 May 2008. ^ "Mission > Mission Status - Dawn Mission". JPL. ^ a b Ammannito, E.; M. C. De Sanctis; E. Palomba; et al. (2013). "Olivine in an unexpected location on Vesta's surface". Nature. 504 (7478): 122–125. Bibcode:2013Natur.504..122A. doi:10.1038/nature12665. PMID 24196707. ^ Cook, Jia-Rui. "It's Complicated: Dawn Spurs Rewrite of Vesta's Story". Archived from the original on 2 May 2014. Retrieved 30 April 2014. ^ Littmann, Mark (2004). Planets Beyond: Discovering the Outer Solar System. Dover Books on Astronomy. Courier Dover Publications. p. 21. ISBN 978-0-486-43602-9. ^ Lynn, W. T. (February 1907). "The discovery of Vesta". The Observatory. 30: 103–105. Bibcode:1907Obs....30..103L. ^ Dunnington, Guy Waldo; Gray, Jeremy; Dohse, Fritz-Egbert (2004). Carl Friedrich Gauss: Titan of Science. The Mathematical Association of America. p. 76. ISBN 978-0-88385-547-8. ^ Rao, K. S.; Berghe, G. V. (2003). "Gauss, Ramanujan and Hypergeometric Series Revisited". Historia Scientiarum. 13 (2): 123–133. ^ Schmadel, Lutz D. (2003). Dictionary of Minor Planet Names: Prepared on Behalf of Commission 20 Under the Auspices of the International Astronomical Union. Springer. p. 15. ISBN 978-3-540-00238-3. ^ von Zach, Franz Xaver (1807). Monatliche correspondenz zur beförderung der erd- und himmels-kunde. 15. p. 507. ^ Carlini, Francesco (1808). Effemeridi astronomiche di Milano per l'anno 1809. ^ Bureau des longitudes (1807). Annuaire pour l'an 1808. p. 5. ^ Canovai, Stanislao; del-Ricco, Gaetano (1810). Elementi di fisica matematica. p. 149. ^ Wells, David A. (1851). Bliss, George Jr., ed. "The Planet Hygiea". Annual of Scientific Discovery for the year 1850, quoted by spaceweather.com archives, 2006-09-13. Retrieved 1 June 2008. ^ From James Hilton's When Did the Asteroids Become Minor Planets? Archived 24 March 2008 at the Wayback Machine, particularly the discussion of Gould, B. A. 1852, On the Symbolic Notation of the Asteroids, Astronomical Journal, Vol. 2, and immediately subsequent history. The discussion of C. J. Cunningham (1988), also from there, explains the parenthetical part. ^ "New SPHERE view of Vesta". www.eso.org. Retrieved 25 June 2018. ^ Hughes, D. W. (September 1994). "The Historical Unravelling of the Diameters of the First Four Asteroids". Quarterly Journal of the Royal Astronomical Society. 35 (3): 331. Bibcode:1994QJRAS..35..331H. ^ Povenmire, H. (September 2001). "The January 4, 1991 Occultation of SAO 93228 by Asteroid (4) Vesta". Meteoritics & Planetary Science. 36 (Supplement): A165. Bibcode:2001M&PSA..36Q.165P. doi:10.1111/j.1945-5100.2001.tb01534.x. ^ Hertz, Hans G. (19 April 1968). "Mass of Vesta". Science. 160 (3825): 299–300. Bibcode:1968Sci...160..299H. doi:10.1126/science.160.3825.299. PMID 17788233. ^ Kovačević, A. (January 2005). "Determination of the mass of (4) Vesta based on new close approaches". Astronomy and Astrophysics. 430 (1): 319–325. Bibcode:2005A&A...430..319K. doi:10.1051/0004-6361:20035872. ^ Christou, A. A. (2000). "Co-orbital objects in the main asteroid belt". Astronomy and Astrophysics. 356: L71–L74. Bibcode:2000A&A...356L..71C. ^ a b Christou, A. A.; Wiegert, P. (January 2012). "A population of Main Belt Asteroids co-orbiting with Ceres and Vesta". Icarus. 217 (1): 27–42. arXiv:1110.4810. Bibcode:2012Icar..217...27C. doi:10.1016/j.icarus.2011.10.016. ISSN 0019-1035. ^ a b c Thomas, P. C.; et al. (1997). "Vesta: Spin Pole, Size, and Shape from HST Images". Icarus. 128 (1): 88–94. Bibcode:1997Icar..128...88T. doi:10.1006/icar.1997.5736. ^ a b Hand, Eric (2012). "Space missions trigger map wars". Nature. 488 (7412): 442–443. Bibcode:2012Natur.488..442H. doi:10.1038/488442a. PMID 22914145. ^ "IAU WGCCRE Coordinate System for Vesta | USGS Astrogeology Science Center". Astrogeology.usgs.gov. 2013-11-15. Retrieved 2014-06-25. ^ Li, Jian-Yang; Mafi, Joseph N. "Body-Fixed Coordinate Systems for Asteroid (4) Vesta" (PDF). Planetary Data System. ^ Gingerich, Owen (2006-08-16). "The Path to Defining Planets" (PDF). Harvard-Smithsonian Center for Astrophysics and IAU EC Planet Definition Committee chair. p. 4. Retrieved 2007-03-13. ^ Baer, James; Chesley, Steven R. (2008). "Astrometric masses of 21 asteroids, and an integrated asteroid ephemeris". Celestial Mechanics and Dynamical Astronomy. 100 (2008): 27–42. Bibcode:2008CeMDA.100...27B. doi:10.1007/s10569-007-9103-8. ^ Fu, R. R.; Hager, B. H.; Ermakov, A.I. ; Zuber, M.T. (2013). "Early Viscous Relaxation of Asteroid Vesta and Implications for Late Impact-Driven Despinning" (PDF). 44th Lunar and Planetary Science Conference: 2115. ^ Asmar, S. W.; Konopliv, A. S.; Park, R. S.; Bills, B. G.; Gaskell, R.; Raymond, C. A.; Russell, C. T.; Smith, D. E.; Toplis, M. J.; Zuber, M. T. (2012). "The Gravity Field of Vesta and Implications for Interior Structure" (PDF). 43rd Lunar and Planetary Science Conference: 2600. ^ Russel, C. T.; et al. (2012). "Dawn at Vesta: Testing the Protoplanetary Paradigm" (PDF). Science. 336 (6082): 684–686. Bibcode:2012Sci...336..684R. doi:10.1126/science.1219381. PMID 22582253. ^ a b c Williams, D. A.; Yingst, R. A.; Garry, W. B. (December 2014). "Introduction: The geologic mapping of Vesta". Icarus. 244: 1–12. Bibcode:2014Icar..244....1W. doi:10.1016/j.icarus.2014.03.001. hdl:2286/R.I.28071. Williams, D. A. (2014). "The geology of the Marcia quadrangle of asteroid Vesta: Assessing the effects of large, young craters". Icarus. 244: 74–88. Bibcode:2014Icar..244...74W. doi:10.1016/j.icarus.2014.01.033. hdl:2286/R.I.28061. ^ a b Scully, J. E. C.; Yin, A.; Russell, C. T.; Buczkowski, D. L.; Williams, D. A.; Blewett, D. T.; Ruesch, O.; Hiesinger, H.; Le Corre, L.; Mercer, C.; Yingst, R. A.; Garry, W. B.; Jaumann, R.; Roatsch, T.; Preusker, F.; Gaskell, R. W.; Schröder, S. E.; Ammannito, E.; Pieters, C. M.; Raymond, C. A. (December 2014). "Geomorphology and structural geology of Saturnalia Fossae and adjacent structures in the northern hemisphere of Vesta". Icarus. 244: 23–40. Bibcode:2014Icar..244...23S. doi:10.1016/j.icarus.2014.01.013. hdl:2286/R.I.28070. Scully, J. E. C.; et al. (2014). "Sub-curvilinear gullies interpreted as evidence for transient water flow on Vesta" (PDF). 45th Lunar and Planetary Science Conference. ^ Schäfer, M.; Nathues, A.; Williams, D. A.; Mittlefehldt, D. W.; Le Corre, L.; Buczkowski, D. L.; Kneissl, T.; Thangjam, G. S.; Hoffmann, M.; Schmedemann, N.; Schäfer, T.; Scully, J. E. C.; Li, J. Y.; Reddy, V.; Garry, W. B.; Krohn, K.; Yingst, R. A.; Gaskell, R. W.; Russell, C. T. (December 2014). "Imprint of the Rheasilvia impact on Vesta – Geologic mapping of quadrangles Gegania and Lucaria". Icarus. 244: 60–73. Bibcode:2014Icar..244...60S. doi:10.1016/j.icarus.2014.06.026. hdl:2286/R.I.28060. ^ Kneissl, T.; Schmedemann, N.; Reddy, V.; Williams, D. A.; Walter, S. H. G.; Neesemann, A.; Michael, G. G.; Jaumann, R.; Krohn, K.; Preusker, F.; Roatsch, T.; Le Corre, L.; Nathues, A.; Hoffmann, M.; Schäfer, M.; Buczkowski, D.; Garry, W. B.; Yingst, R. A.; Mest, S. C.; Russell, C. T.; Raymond, C. A. (December 2014). "Morphology and formation ages of mid-sized post-Rheasilvia craters – Geology of quadrangle Tuccia, Vesta". Icarus. 244: 133–157. Bibcode:2014Icar..244..133K. doi:10.1016/j.icarus.2014.02.012. hdl:2286/R.I.28058. ^ Zellner, N. E. B.; Gibbard, S.; de Pater, I.; et al. (2005). 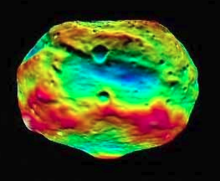 "Near-IR imaging of Asteroid 4 Vesta" (PDF). Icarus. 177 (1): 190–195. Bibcode:2005Icar..177..190Z. doi:10.1016/j.icarus.2005.03.024. Archived from the original (PDF) on 23 November 2008. ^ Jaumann, R.; et al. (2012). "Vesta's Shape and Morphology". Science. 336 (6082): 687–690. Bibcode:2012Sci...336..687J. doi:10.1126/science.1219122. PMID 22582254. ^ a b c Schenk, P.; et al. (2012). "The Geologically Recent Giant Impact Basins at Vesta's South Pole". Science. 336 (6082): 694–697. Bibcode:2012Sci...336..694S. doi:10.1126/science.1223272. PMID 22582256. ^ "Rheasilvia – Super Mysterious South Pole Basin at Vesta is Named after Romulus and Remus Roman Mother". Universe Today. 21 September 2011. Retrieved 23 September 2011. ^ Binzel, R. P.; et al. (1997). "Geologic Mapping of Vesta from 1994 Hubble Space Telescope Images". Icarus. 128 (1): 95–103. Bibcode:1997Icar..128...95B. doi:10.1006/icar.1997.5734. ^ Karimi, S; Dombard, A.J. (2016). "On the possibility of viscoelastic deformation of the large south polar craters and true polar wander on the asteroid Vesta". Journal of Geophysical Research. 121 (9): 1786–1797. Bibcode:2016JGRE..121.1786K. doi:10.1002/2016JE005064. ^ IAU. "Planetary Names Target: Vesta". ^ Buczkowski, Debra (2012). "Large-scale troughs on Vesta: A signature of planetary tectonics". Geophysical Research Letters. 39 (18): L18205. Bibcode:2012GeoRL..3918205B. doi:10.1029/2012GL052959. ^ Buczkowski, Debra; Raymond, C. A.; Williams, D. A.; Schenk, P. M.; Roatsch, T.; Preusker, F.; Jaumann, R.; Gaskell, R. W.; Yingst, R. A.; Mest, S.; Garry, W. B.; Reddy, V.; Nathues, A.; Le Corre, L.; Russell, C. T.; Scully, J. E.C. ; Wyrick, D. Y.; Barnouin, O. S.; Kahn, E. G.; Iyer, K. A. "Asteroid's troughs suggest stunted planet". Large-scale troughs on Vesta: A signature of planetary tectonics. American Geophysical Union. Retrieved 25 November 2012. ^ De Sanctis, M. C.; et al. (2012). "Spectroscopic Characterization of Mineralogy and Its Diversity Across Vesta". Science. 336 (6082): 697–700. Bibcode:2012Sci...336..697D. doi:10.1126/science.1219270. PMID 22582257. ^ Prettyman, T. H.; et al. (2012). "Elemental Mapping by Dawn Reveals Exogenic H in Vesta's Regolith". Science. 338 (6104): 242–246. Bibcode:2012Sci...338..242P. doi:10.1126/science.1225354. PMID 22997135. ^ a b Reddy, V.; et al. (2012). "Color and Albedo Heterogeneity of Vesta from Dawn". Science. 336 (6082): 700–704. Bibcode:2012Sci...336..700R. doi:10.1126/science.1219088. PMID 22582258. ^ Denevi, B. W.; et al. (2012). "Pitted Terrain on Vesta and Implications for the Presence of Volatiles". Science. 338 (6104): 246–249. Bibcode:2012Sci...338..246D. CiteSeerX 10.1.1.656.1476. doi:10.1126/science.1225374. PMID 22997131. ^ De Sanctis, M. C.; et al. (2012). "DETECTION OF WIDESPREAD HYDRATED MATERIALS ON VESTA BY THE VIR IMAGING SPECTROMETER ON BOARD THE DAWN MISSION". The Astrophysical Journal Letters. 758 (2): L36. Bibcode:2012ApJ...758L..36D. doi:10.1088/2041-8205/758/2/L36. ^ "Press release: A look into Vesta's interior". Max Planck Institute for Solar System Research, Göttingen. January 6, 2011. ^ Ghosh, A.; McSween, H. Y. (1998). "A Thermal Model for the Differentiation of Asteroid 4 Vesta, Based on Radiogenic Heating". Icarus. 134 (2): 187–206. Bibcode:1998Icar..134..187G. doi:10.1006/icar.1998.5956. ^ Righter, K.; Drake, M. J. (1997). "A magma ocean on Vesta: Core formation and petrogenesis of eucrites and diogenites". Meteoritics & Planetary Science. 32 (6): 929–944. Bibcode:1997M&PS...32..929R. doi:10.1111/j.1945-5100.1997.tb01582.x. ^ Drake, M. J. (2001). "The eucrite/Vesta story". Meteoritics & Planetary Science. 36 (4): 501–513. Bibcode:2001M&PS...36..501D. doi:10.1111/j.1945-5100.2001.tb01892.x. ^ Sahijpal, S.; Soni, P.; Gagan, G. (2007). "Numerical simulations of the differentiation of accreting planetesimals with 26Al and 60Fe as the heat sources". Meteoritics & Planetary Science. 42 (9): 1529–1548. Bibcode:2007M&PS...42.1529S. doi:10.1111/j.1945-5100.2007.tb00589.x. ^ Gupta, G.; Sahijpal, S. (2010). "Differentiation of Vesta and the parent bodies of other achondrites". J. Geophys. Res. Planets. 115 (E8): E08001. Bibcode:2010JGRE..11508001G. doi:10.1029/2009JE003525. ^ Cook, Jia-Rui C. (29 March 2011). "When Is an Asteroid Not an Asteroid?". NASA/JPL. Archived from the original on 29 June 2011. Retrieved 30 July 2011. ^ Takeda, H. (1997). "Mineralogical records of early planetary processes on the HED parent body with reference to Vesta". Meteoritics & Planetary Science. 32 (6): 841–853. Bibcode:1997M&PS...32..841T. doi:10.1111/j.1945-5100.1997.tb01574.x. ^ Yamaguchi, A.; Taylor, G. J.; Keil, K. (1995). "Metamorphic History of the Eucritic Crust of 4 Vesta". Meteoritical Society. 30 (5): 603. Bibcode:1995Metic..30..603Y. ^ Pieters, C. M.; Ammannito, E.; Blewett, D. T.; Denevi, B. W.; De Sanctis, M. C.; Gaffey, M. J.; Le Corre, L.; Li, J. -Y.; Marchi, S.; McCord, T. B.; McFadden, L. A.; Mittlefehldt, D. W.; Nathues, A.; Palmer, E.; Reddy, V.; Raymond, C. A.; Russell, C. T. (2012). "Distinctive space weathering on Vesta from regolith mixing processes". Nature. 491 (7422): 79–82. Bibcode:2012Natur.491...79P. doi:10.1038/nature11534. PMID 23128227. ^ McCord, T. B.; Li, J. -Y.; Combe, J. -P.; McSween, H. Y.; Jaumann, R.; Reddy, V.; Tosi, F.; Williams, D. A.; Blewett, D. T.; Turrini, D.; Palomba, E.; Pieters, C. M.; De Sanctis, M. C.; Ammannito, E.; Capria, M. T.; Le Corre, L.; Longobardo, A.; Nathues, A.; Mittlefehldt, D. W.; Schröder, S. E.; Hiesinger, H.; Beck, A. W.; Capaccioni, F.; Carsenty, U.; Keller, H. U.; Denevi, B. W.; Sunshine, J. M.; Raymond, C. A.; Russell, C. T. (2012). "Dark material on Vesta from the infall of carbonaceous volatile-rich material". Nature. 491 (7422): 83–86. Bibcode:2012Natur.491...83M. doi:10.1038/nature11561. PMID 23128228. ^ Rayman, Marc (8 April 2015). Now Appearing At a Dwarf Planet Near You: NASA's Dawn Mission to the Asteroid Belt (Speech). Silicon Valley Astronomy Lectures. Foothill College, Los Altos, CA. Retrieved 2018-07-07. ^ Ulivi, Paolo; Harland, David (2008). Robotic Exploration of the Solar System: Hiatus and Renewal, 1983–1996. Springer Praxis Books in Space Exploration. Springer. pp. 117–125. ISBN 978-0-387-78904-0. ^ Russell, C. T.; Capaccioni, F.; Coradini, A.; et al. (October 2007). "Dawn Mission to Vesta and Ceres" (PDF). Earth, Moon, and Planets. 101 (1–2): 65–91. Bibcode:2007EM&P..101...65R. doi:10.1007/s11038-007-9151-9. Retrieved 13 June 2011. ^ Cook, Jia-Rui C.; Brown, Dwayne C. (11 May 2011). "NASA's Dawn Captures First Image of Nearing Asteroid". NASA/JPL. Retrieved 14 May 2011. ^ Vega, Priscilla; Brown, Dwayne (16 July 2011). "NASA's Dawn Spacecraft Enters Orbit Around Asteroid Vesta". NASA. Retrieved 17 July 2011. ^ Mid-continent Research for Education and Learning: McREL (27 September 2010). "Dawn Mission: Mission". Dawn Journal. Retrieved 29 March 2011. ^ "Dawn has Departed the Giant Asteroid Vesta". NASA JPL. NASA. 5 September 2012. Retrieved 5 September 2012. ^ a b Russell, Christopher T.; et al. (2013). 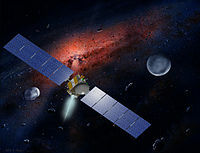 "Dawn completes its mission at 4 Vesta". Meteoritics & Planetary Science. 48 (11): 2076–2089. Bibcode:2013M&PS...48.2076R. doi:10.1111/maps.12091. ^ Roatsch, Thomas; et al. (2012). "High resolution Vesta High Altitude Mapping Orbit (HAMO) Atlas derived from Dawn framing camera images". Planetary and Space Science. 73 (1): 283–286. Bibcode:2012P&SS...73..283R. doi:10.1016/j.pss.2012.08.021. ^ Roatsch, Thomas; et al. (2013). "High-resolution Vesta Low Altitude Mapping Orbit Atlas derived from Dawn Framing Camera images". Planetary and Space Science. 85: 293–298. Bibcode:2013P&SS...85..293R. doi:10.1016/j.pss.2013.06.024. ^ "NASA's Journey Above Vesta". DLR Institute of Planetary Research video with NASA JPL imagery. NASA. 16 September 2011. Retrieved 18 September 2011. ^ "DLR public Dawn products site". Archived from the original on 16 October 2015. ^ "Dawn Public Data". Dawn [website]. Univ. California, Los Angeles. Retrieved 6 March 2015. ^ Bryant, Greg (2007). "Sky & Telescope: See Vesta at Its Brightest!". Retrieved 7 May 2007. ^ "Vesta Finder". Sky & Telescope. Archived from the original on 12 June 2007. Retrieved 7 May 2007. ^ Harrington, Philip S. (21 October 2010). Cosmic Challenge: The Ultimate Observing List for Amateurs. Cambridge University Press. p. 75. ISBN 9781139493680. ^ a b James, Andrew (2008). "Vesta". Southern Astronomical Delights. Retrieved 6 November 2008. ^ a b Yeomans, Donald K.; Chamberlin, Alan B. "Horizons Ephemeris". JPL Solar System Dynamics. Retrieved 9 January 2010. ^ "2012 Astronomy Special". Nightskyonline.info. Archived from the original on 20 April 2012. Retrieved 23 November 2012. ^ a b c d T. Flanders – Ceres and Vesta: July 2012 – April 2013 – Sky & Telescope. Wikimedia Commons has media related to Vesta (asteroid). This video explores Vesta's landscape, history and planet-like characteristics. Shiga, David. "Dawn captures first orbital image of asteroid Vesta". New Scientist. Retrieved 7 August 2011. Amos, Jonathan (22 July 2011). 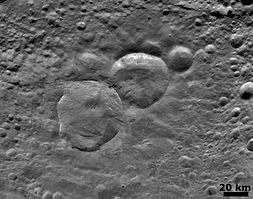 "Vesta rock turns for Dawn probe". BBC Online. BBC News. Archived from the original on 28 July 2011. Retrieved 14 August 2011. Kremer, Ken (23 July 2011). "Dawn Spirals Down Closer to Vesta's South Pole Impact Basin". Universe Today. Retrieved 14 August 2011. Space Telescope Science Institute (2009). Hubble 2008: Science year in review. NASA Goddard Space Flight Center. p. 66. HubbleSite: short movie composed from Hubble Space Telescope images from November 1994. Horton, Adam. 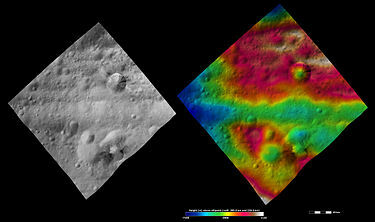 "NASA's DAWN Mission Creates 4 Vesta Geological Map ." 14 December 2014. This page was last edited on 15 March 2019, at 00:41 (UTC).